Examine the basic elements of print especially type and image. Incorporate the creative design process into a functional page layout solution. Use industry relevant software to design effective and creative layouts by combining imagery and text in traditional and non-traditional formats. Apply professional practices including the creative design process and design planning process; that help to ensure success, consistency and quality when developing a visual idea from a verbal communication or concept. 1. Research newspaper layouts and pick 2-3 that you think are successful. Show me your inspiration for layout design. 2. 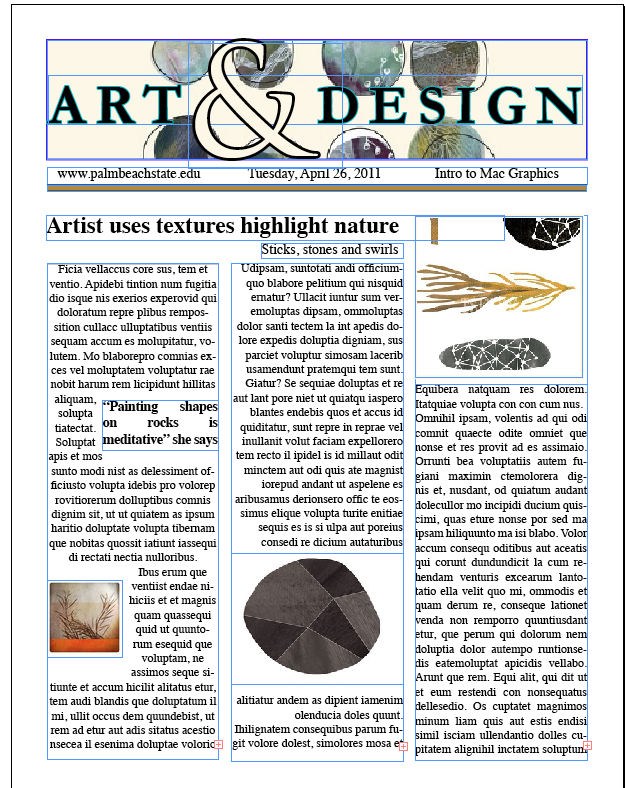 Assignment: Design a two-page spread of a fictional newspaper or magazine section. Think: Arts/Entertainment; Sports; News; could be a more specific hobby, etc. 1. Mast Head : Type + Texture/color background. Subhead including website, date, weather, etc. 4. Must use at least 3 different sized images. Images must be taken by you! Final Size: Ledger standard size of (2) 11 x 17″ saved as a InDesign document and a packaged PDF. Due on our last class April 26! I will show many student examples today. Remember that we are building a logo, business card (front and back), letterhead and novelty item. Start with the logo, then work from there to create a consistent and successful branding campaign. Step One: Research – Search online for examples of quality marketing and branding strategies. Make a PDF document of 5 logos and 5 identity systems that you think are interesting and successful in marketing their product as well as graphic design principles. Also see this site, I searched “Identity System” within the pins! Step Two: Begin building your logo using vector graphics in Illustrator. Final Step: Import vector graphics into an Illustrator document consisting of (4 ) 8.5 x 11″ art boards. Place your logo, business card (3.5 x 2″), letterhead and novelty item design each on a separate art board. We will critique them individually as well as an entire branding strategy. We’ll spend today introducing the project, brainstorming and watching Illustrator training videos to prep for starting this project. For tips additional tips on how to use the pen tool, see this link HERE.